Illustration by James Warner; used with permission. You know that Abraham Lincoln wrote the Gettysburg Address and the Emancipation Proclamation, but did you know he also penned a special order of reprieve to save the life of a turkey named Jack? That November, a citizen sent a live turkey to the White House to be part of a holiday feast. 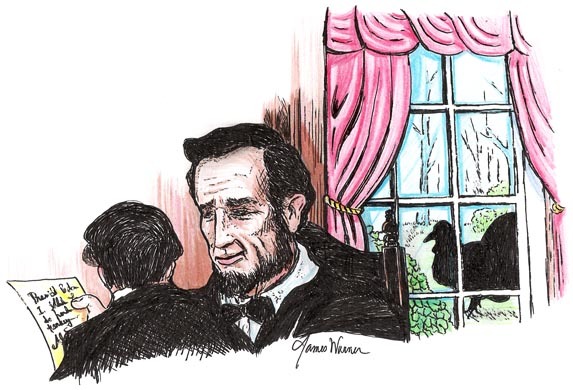 Lincoln’s son, Tad, who was 10, bonded with the bird. In addition to naming him Jack, Tad treated the turkey like a pet and taught it to follow him around the White House grounds. When Tad learned that Jack was to be killed and prepared for a big meal, he interrupted his father at a cabinet meeting, crying and pleading that his new friend be spared. Jack then became a part of the Lincoln pets collection, which also included a pig, a rabbit, ponies, goats, cats and dogs. On Election Day in 1864, the president, his son Tad, and his secretary Noah Brooks were at a White House window watching soldiers vote at a special booth set up for them on the grounds, when Jack strolled into view. It has been 46 years since a pet bird called the White House home.